A reminder that you can better enjoy each story if you click on the title of a story in the bulletin where you'll be taken to the story on our website, displayed in easy-to-view full-page format. June is Rotary Fellowship month and is the last month of the Rotary Year; a time to reflect. Jennifer A. Harhigh, U.S. Consulate General, Chiang Mai recently said “Good intentions, in of themselves, are not enough”. I totally agree! 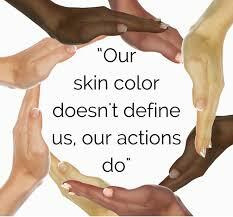 We must be “People of Action” and we are! The CMIRC Children’s Water Safety and Drowning Prevention Program has been awarded a booth at the Rotary International Convention in Toronto, Canada. Our President-Elect John Schorr will be there June 23 - 27, at booth 705 in the House of Friendship. Please visit us. 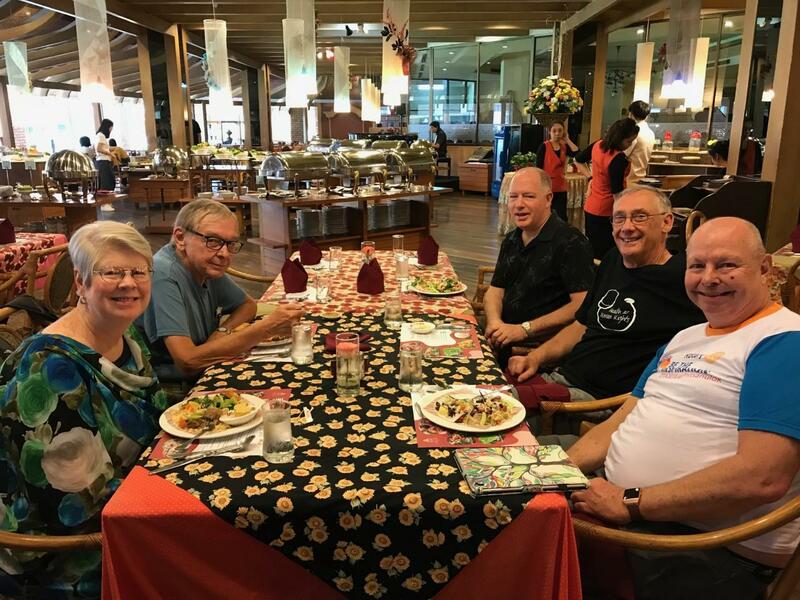 Recently, Rotarian Gary Herman started an informal lunch group “Let's Talk Rotary” that meets on the last Friday of each month at the Lotus Hotel in Kad Suan Kaew mall. Although I haven't been able to attend, I’m told that this informal group is popular and a great tool for fellowship within our club. One of the goals in our strategic plan is to sponsor an Interact Club. I’m delighted to report a “kickoff” meeting at Chiang Mai International School (CMIS) on 24 May. 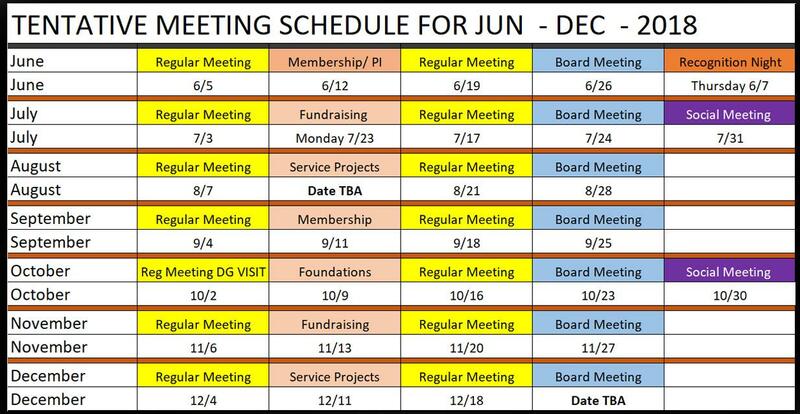 We anticipate the Interact club will be chartered as early as September. CMIS staff, students and CMIRC Rotarians are all excited about this new avenue into community service! Many thanks to honorary member Stasha Malcolm for her great efforts coordinating the startup of this club and to Rotarian Michael Gholson for taking a leadership role in this new program. The Children’s Water Safety and Drowning Prevention Program, championed by President-Elect John Schorr, serves the 11 Tessaban schools in Chiang Mai. The relationship established with the Chiang Mai municipal government is allowing us to expand support for these poor schools in the coming months. We anticipate a Children’s Vision Screening project in conjunction with Chiang Mai University School of Medicine and the introduction of our English Language Cultural Exchange program as well. We anticipate that the 11 Tessaban schools will become a Rotary Community Corps. Championed by Rotarian Mike Lake and recently Gary Herman, our project at the Burma Children Medical Fund's B.K.Kee patient house has improved the facility by overseeing the repair of roofs, rebuilding toilet rooms and putting grates over drains in the area. A library has been established and a sala placed in the yard. Members also spend time with the children, playing games and helping them with conversational English. Our newest project, the English Language Cultural Club, is currently concentrating on helping students at BEAM. Project Champion Linda Pfotenhauer, in coordination with the BEAM staff, has found opportunities for their students to interact with our members while learning skills necessary to take the American G.E.D. test and become more competitive in their quest for both higher education and employment. At the Mae Tao Clinic, we have had a very successful year in both fund raising and the conducting of informational tours. Our fundraising efforts for RY 2017-2018 have been mostly directed at supporting the Child Development Center’s pre-G.E.D. program and funding students who wish to attend G.E.D. 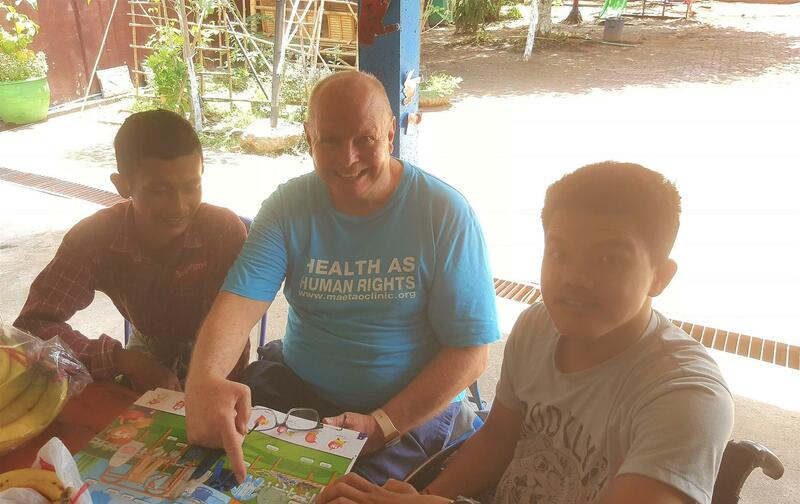 programs in Mae Sot and in Chiang Mai. Our efforts for RY 2018-2019 will include informational tours and support for the birth registration program. It is my honor and privilege to serve as the Champion of the Mae Tao Clinic project. The bulletin in which this article appears has been under the championship of Nancy Lindley for the past few months. Since she took it over from yours truly, the quality has greatly improved. Congratulations and thank you Nancy! I’m confident that all will agree that CMIRC has indeed taken good intentions and turned them into great results. While the business of this club is done in the English language it is the language of the heart that allows us to move forward and to accomplish what we have done and what we will do. What we need are more committed members, people who live in the Chiang Mai area and are looking for opportunities to give back to community. It’s an opportunity for both fellowship and service! Care to find out more? Just contact me, or any member of Chiang Mai International Rotary Club. My sincere thanks to all the members of Chiang Mai International Rotary Club, our District 3360 officers, especially DG Nithi Soongsawan, our supporters from around the globe, especially the Rotary Club of Kamloops West, B.C. and Safe Child Thailand. You have made Rotary Year 2017-2018 a blazing success. Thank you! Several times a year, I take fellow Rotarians and other interested people to tour the Mae Tao Clinic (MTC) in Mae Sot to see the wonderful things happening in what began as a humble clinic that has evolved into a umbrella social services organization for migrants, refugees and other displaced Burmese people. CMIRC has been proud to support several projects of MTC since the earliest days of the club. Our recent visit on 17 May was one of the best tours to date. The day before, several club members traveled from Chiang Mai: CP Roger, Honorary Member Stasha and me. We were joined by Rotarian Dr. Raj Mani from the RC of Aireborough, Leeds, UK and his son, Dr. Ravi Mani. My friend and supporter, Bob Morris drove from Korat to be with us. Another friend Dr. Rahul Snarula from Mae Sot joined us for much of the day. Many thanks to all the interested people who joined in the day. We started with breakfast and coffee at the Borderline Café. Good food, great coffee and even better fellowship set the tone for the rest of the day! The next order of business was a tour of the new campus of the Mae Tao Clinic to view patient registration and then onto the several wards and departments of the Mae Tao Clinic. My favorite has always been the newborn ward. Five to fifteen babies are born at the clinic each day. Then, Dr. Raj made a presentation to the medical staff on challenges and prevention of lower extremity wounds. We made connections and it looks like one of the benefits of this day will be publication of an article by Mae Tao Clinic medical adviser Dr. Arkar. From the new campus, we went to the Child Development Center (CDC) where staff was busy preparing for the school opening on 31 May. We toured the campus and everyone was impressed by the school. When I visit I always take away success stories, meet great youngsters and leave re-energized. CDC can accommodate up to a thousand students. Attendance last year was between 850 and 890 and it’s anticipated that this year will be very similar. We met with Mr. Sunil Martin who teaches economics and history, and Naw Gold Rain, the inspirational pre-GED teacher, as well as Saw Myo Nyunt the vice-principal. The day before Gold Rain had injured her ankle, but she insisted showing us around the campus. After a tasty lunch at place known only as the “Vegetarian Restaurant”, we headed for the old campus, the home of Mae Tao Clinic for many years. When I first started going to the Mae Tao Clinic I could literally feel the place; it was like a million souls were trying to tell me their story. The first thing I noticed after the new campus opened was the place felt sterile. I must say that two years later, the new clinic is staring to have that feeling and appears to be alive as well. What was once the newborn ward at the old clinic is now housing. Other wards and offices have been turned into offices for supporting organizations, training rooms, meeting rooms and housing. The prosthesis lab is the only part of the old Mae Tao Clinic that hasn't yet moved to the new campus. The highlight of the old campus tour was a brief meeting with Dr Cynthia, the founder of the MTC. Also, we attended a meeting at the office of the Committee for the Protection and Promotion of Child Rights (CPPCR), one of the community based organizations now at the old campus. The purpose of the meeting was to discuss fundraising opportunities for Birth Registration efforts. I wish I could take this entire team to every fund raising meeting; their collective input was amazing. Just watching Rotarians collaborating is worth the price of the ticket! Also, we made connections with the good people from Safe Child Thailand. After a long day of learning and sharing we might have been ready for a rest, but no! That evening the whole crew visited the Rotary Club of Mae Sot, Muang. Our fellow Rotarians in Mae Sot are most gracious hosts. The day was great, the people fantastic and the connections were amazing. I hope you can join in an future tour. We all receive inspiration from different sources. On 30 May, I received a great reminder; our efforts do pay results. I had arrived at the bus station in Chiang Mai for my trip to Mae Sot, the 2nd trip for the month! Standing there, I was watching people crowd ahead of me to check their bags, just wanting the trip to be over when suddenly my inspiration was standing right in front of me. “Hello Jerry, are you going to Mae Sot too”? It was Myo Sandar Win (Miki) standing there next to Khin Twel Win (Smile). Miki and Smile are two students from Mae Tao Clinic who just successfully completed their G.E.D. test at BEAM in Chiang Mai. It was such a delight to see them. Their journeys are far from over, but with the G.E.D. in their CV’s they have opportunities never before possible. At lunch I spoke with them. They are both working on getting scholarships or other funding so they can attend Chiang Mai University. Smile is interested in nursing and, for the next three months, will volunteer at the Mae Tao Clinic where she will work in patient registration. Miki wants to study Social Science to be an organization coordinator. She hopes to volunteer at Mae Tao Clinic’s Child Development Center for the next three months. The theme for RY 2018-2019 is “Be The Inspiration”. It cuts both ways for me. Hopefully our Rotary work will inspire others and certainly young people like Miki and Smile inspire me! The CMIRC-Kru Payu Children’s Water Safety and Drowning Prevention Program is ready to start its third year serving all 11 Chiang Mai Municipal Schools. Once again this year, every 4th grader in all 11 schools will have the opportunity to learn basic survival swimming and water safety. 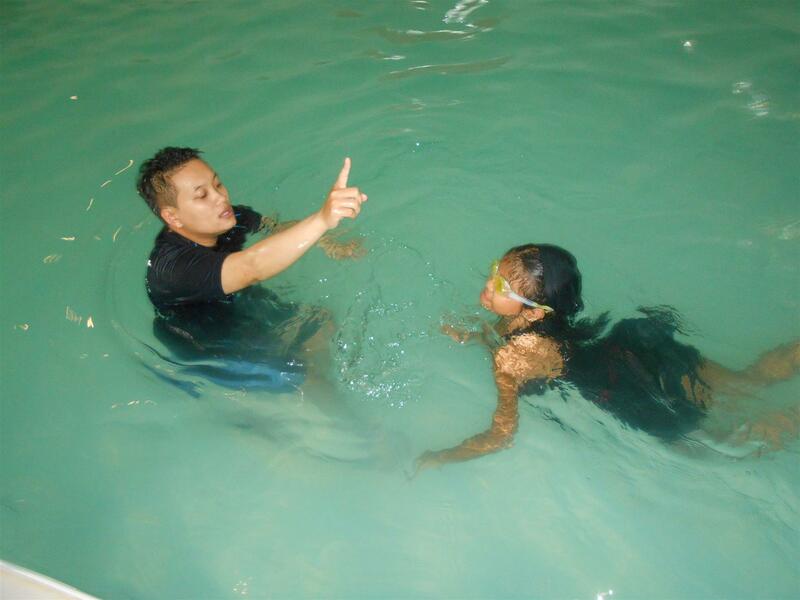 Our Kru Payu Swim instructors will begin our courses at Bronco Kids Sport Center for the Wat Gu Kam and Wat Gate Municipal Schools on June 5th and for the Wat Puak Chang and Wat Mun Ngen Gong Municipal Schools on June 6th. We have also planned a Certificate Ceremony at the Wat Gu Kam School for students who completed the course since January 1 of this year. The ceremony will be on June 6, at 9:30am. All CMIRC members are welcome to attend. We are proud to say that by the end of this year, our survival swim courses will have reached over 1,000 children in Chiang Mai, and beginning this year, we can say that every graduate of a Chiang Mai Municipal School will have had the opportunity to learn survival swimming. This is truly a milestone. Drowning is the leading cause of death for children in Thailand and most poor children do not know how to swim or what to do when they see friends or family members in trouble in the water. The CMIRC-Kru Payu Children’s Water Safety and Drowning Prevention Program is working to reduce the tragic loss of over 1,000 children every year in Thailand. 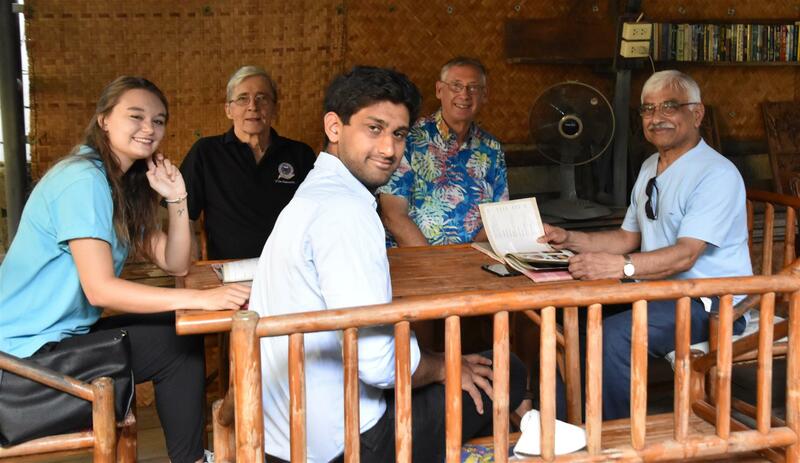 In June, CMIRC will host Safe Child Thailand Foundation (SCT) staff in Chiang Mai when CMIRC and Lampang Rotary CWSDP committee members meet with visiting SCT staff on June 6 at 12 noon. Afterwards, SCT staff will have an opportunity to see the program in action with 4th graders from two municipal schools at Bronco Kids Sports Center from 1pm to 2pm. 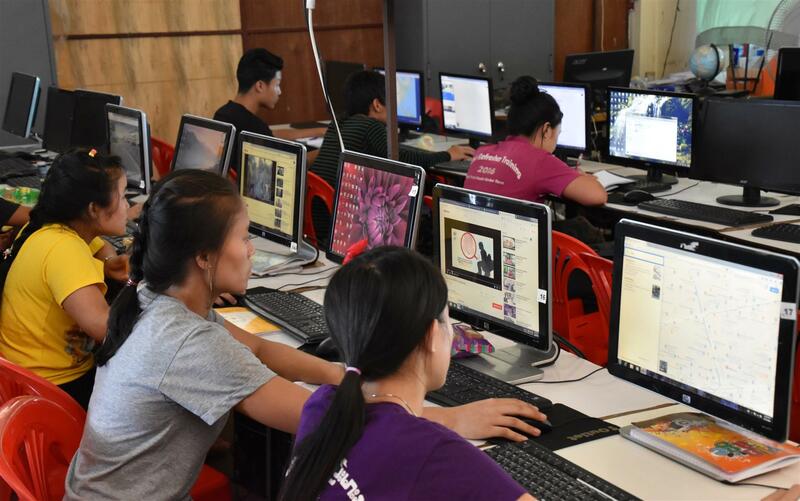 SCT has been a major funder of the CWSDP program expansion, granting over 450,000 Baht to fund pilot programs in Lampang, beginning in Fall 2017 and in Phuket beginning in June 2018. Plans include future program expansion in Phetchabun Province in Isaan and in Bangkok. The expansion is designed to work with local Rotary Clubs that agree to continue the programs at their own expense after initial pilot programs, staff training, equipment purchase, and evaluation are completed by our Kru Payu-CMIRC staff. After leaving Chiang Mai, the SCT staff will also have an opportunity to observe our expansion program in Patong Beach, Phuket. May has been a quiet month at the Burma Children Medical Fund's Baan K. Kee patient house in Chiang Mai with fewer patients due to the start of Low Season. Starting June 10th we will be switching our weekly visit day to Sunday mornings in order to have greater interaction with the patients. CMIRC members -- please let me know if you'd like to join us. In May, we did have a re-start of our English Language conversation practice. Our first day was interesting. 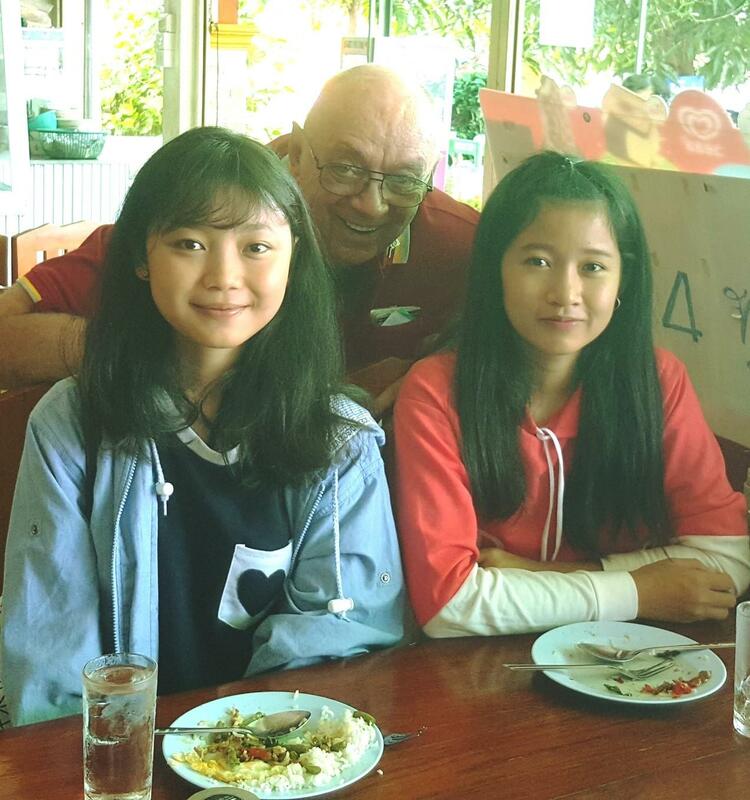 The photo is of two adult patients, one Thai and the other Karen, our only common language is the English all are practicing! One of the students in a wheelchair is the father of a baby recovering from surgery on both legs. Our welcome kits for new patients include Toothpaste and brushes, soap and shampoo and other toiletries. We also provide some school supplies for older children. 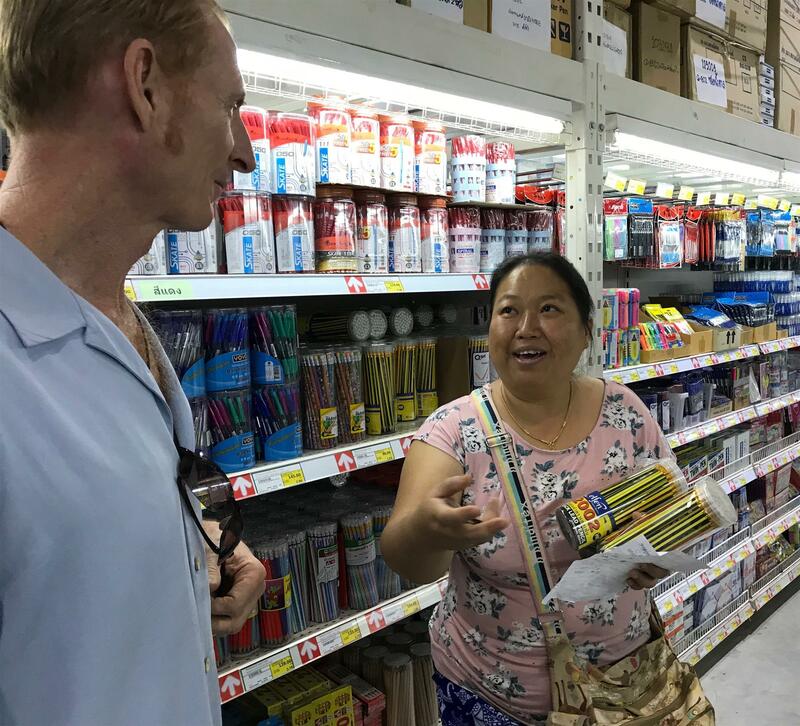 While shopping for supplies for welcome kits for the patients, Mike Lake and I ran into a Karen couple at Makro shopping for a church group supplying school supplies to Karen Villages near Mae Sot. There is need for a lot more! 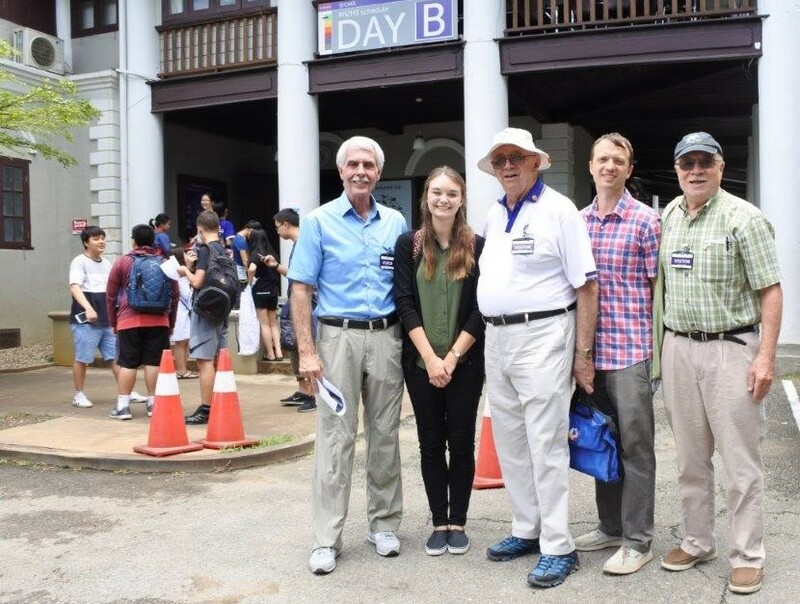 On May 24 PE John, P Jerry, Mike Gholson, and Stasha Malcolm met with staff members of Chiang Mai International School (CMIS) to officially begin coordinating and planning the newly established Interact club at CMIS. The club will begin in August with the onset of the new academic year and has already garnered interest among students on campus. The discussion included a potential service trip to Mae Tao Clinic, creating a Reading Buddy program with the local Chiang Mai Tessabaan Schools, and other possible service projects. We are very excited about the potential and ambitions of the Interact Club at CMIS! Rob Johnson, the Service Learning Coordinator at CMIS, will take the lead as the club’s adviser with CMIRC member Mike Gholson acting as liaison. 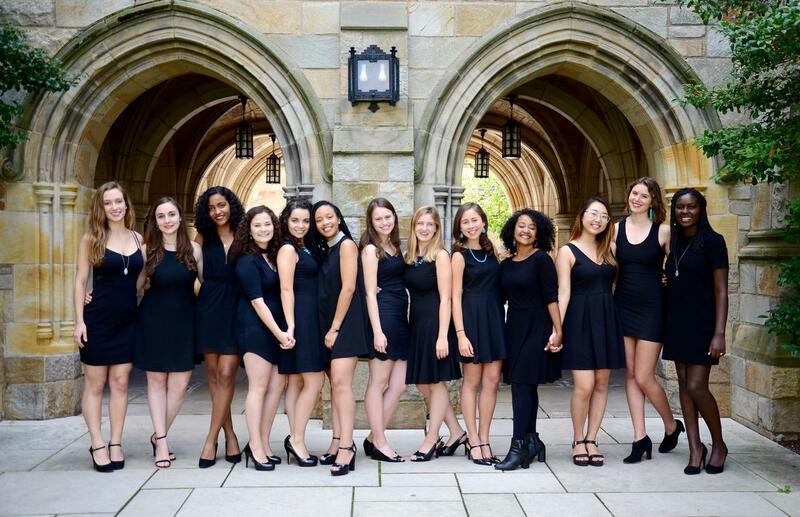 On Thursday, 7th June, the fourteen ladies of Yale University's senior women's a cappella choral group Whim 'n Rhythm will perform at River Market restaurant in a free concert to benefit the Children's Projects of CMIRC. The concert starts at 7:30 p.m. and is proceeded by a Special Recognition Dinner where CMIRC will honor members of the community who have helped to make our Children's Projects a success. Members of CMIRC are invited to join in this dinner and enjoy a very special menu for just 400 baht. Social time begins at 5:30 pm, with appetizers served at 5:45 pm and dinner at 6 p.m.
During the intermission of the concert, CMIRC officers will have a chance to talk to the audience about our Children's Projects and we'll take the hungry wicker elephants Chok Dee (pictured above left) and his sister Jai Dee on a walk through the crowd to collect their dinner of donations. The visit of Whim 'n Rhythm to Chiang Mai is sponsored by CMIRC and River Market Restaurant as part of their post-graduation, eight-week World Tour. While in Chiang Mai, they will also perform at the Northern School for the Blind and Dok Kaew Assisted Living Center and McKean Rehabilitation Center. They'll have some free time, too, to entertain and be entertained by the elephants at the Maetaeng Elephant Park. If you and your family would like to join in the CMIRC's Special Recognition Dinner and enjoy the fabulous menu listed above for 400 baht, please email tablecaptain@cmirc.org for a reservation. So taking twenty years off from the date of the article would suggest that perhaps 1967 was when black people could join a Rotary Club. “The Rotary Club of Birmingham, whose membership of about 360 includes many of the most powerful men in the state, voted this month to retain a rule restricting membership to white men. It is one of only a few of the 19,600 Rotary clubs in the nation with such a policy against black men. As a worldwide organization, since 1922 Rotary International has required all new clubs to adopt the standard club constitution, which has no restrictions concerning race. A constitution and bylaws dated 1932 are the earliest in The Wilmington Rotary Club’s archives. Despite the pervasive and official racial segregation of the time, these documents say only that membership is open to “adult male persons of good character and good business or professional reputation.” Race is never mentioned. Nevertheless, the Wilmington club remained all-white until the 1980's. The race issue surfaced nationally in 1982 when the editor of The Birmingham Post-Herald proposed changing his Rotary club’s explicitly whites-only charter. In a secret vote, the Birmingham club voted 120-90 to continue the ban. The editor resigned in protest. When the news got out, RI acted promptly, declaring that “racial discrimination has no place in Rotary” and banning “any club from limiting membership in the club on the basis of race, color, creed or national origin.” The Birmingham club, threatened with having its charter revoked, agreed by voice vote of 200 to 1 to permit non-white members. The Wilmington club’s archives don’t show much conversation about racial diversity until 1987, when arguments over women were dominating board meetings. That year, Father Thomas Hadden, pastor of St. Mary Catholic Church, became the club’s first African-American member. Five years passed before the next African-American joined. Linda Pearce, CEO of Elderhaus Adult Day Services, was inducted in 1992. A graduate of Williston High School, Pearce had moved back to Wilmington 12 years earlier after working at the Library of Congress in Washington, D.C."
Might one deduce from this information that a policy may exist but it may not be rigorously adopted and enforced? Join a Rotarian Action Group to share your expertise and make a difference in projects beyond your club or district. To see current action groups go to https://my.rotary.org/en/rotarian-action-groups and contact the one you’re interested in. On the 1st of May Dr. Christa Crawford talked to our club on the topic “Human Trafficking and Exploitation in Thailand/Myanmar." The club had a record turnout for this meeting. We heard about the complexity of this issue. On every Thursday in the month visitors from our club went to visit the children at the Burma Children Medical Fund’s B.K. Kee House here in Chiang Mai. On the 8th of May the Service Projects/Fundraising Committee met to review project budget needs for Rotary Year 2018-19 and the sources of funding to support these projects. On the 9th of May the Children’s Water Safety and Drowning Prevention Committee met at Bronco Kids Sports to discuss upcoming classes for Rotary Year 2018-19. Also planned for the June visit by representatives from Safe Child Thailand (SCT) who are financially sponsoring programs outside of Chiang Mai. On the 15th of May our club had a Club Assembly at Hong Kong Lucky Restaurant. 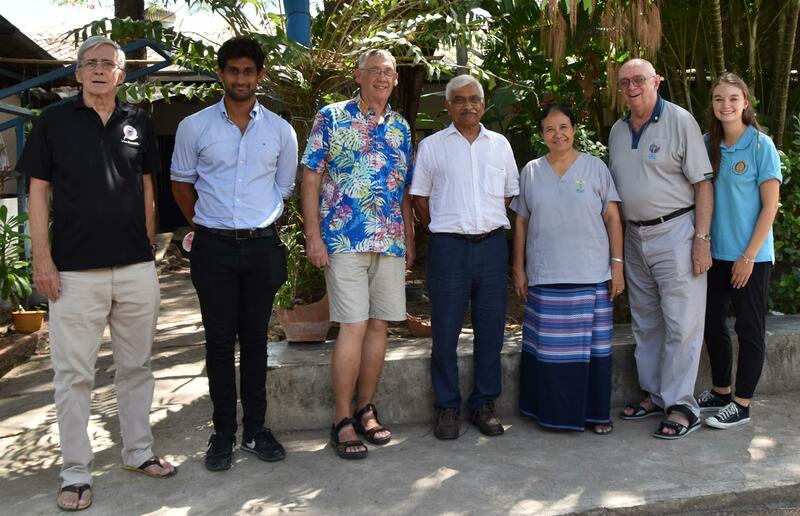 On 16 -18 May Rotarians Roger and Jerry, Honorary Rotarian Stasha and visiting Rotarian Dr. Raj Mani took the bus to Mae Sot to visit the Mae Tao Clinic for update on activities there. On 19 - 20 May Rotarians Jerry, Colin, John, Gary and Nancy attended the D3360 District Training Assembly in Phitsanulok. On the 22nd of May there was the regular monthly CMIRC Board Meeting. The meeting was a two parts: the current year business and planning for next Rotary Year club business. Board members for current Rotary Year 2017-2018 and those for RY 2018-19 attended. On the 25th of May the informal CMIRC lunch group Let's Talk Rotary got together at Hotel Lotus Pang Suan Restaurant for eating and talking. The next Let's Talk Rotary lunch is Friday, 29th of June, 11.30 am at the Hotel Lotus Pang Suan Restaurant buffet, located in the back of Kad Suan Kaew, first floor. On your calendar for the evening of the 7th of June, the Whim n’ Rhythm singers from Yale University will make a round-the-world stop in Chiang Mai and do a benefit fundraising performance for our club at The River Market Restaurant. More about the group at https://www.whimnrhythm.com/about. 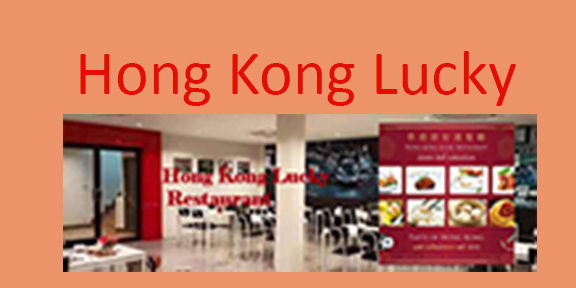 05 June 2018 - Regular club Meeting 7 p.m. Hong Kong Lucky Restaurant. Speaker: PE John Schorr on club goals and his background. 07 June 2018 – CMIRC Recognition Night 5:30 p.m. at River Market Restaurant, Chiang Mai. 07 June 2018 – Whim ’n Rhythm concert 7:30 p.m. at River Market, Chiang Mai. 15 June 2018 - District 3360 Awards Night, Nan. 23 – 27 June 2018 – Rotary International Convention, Toronto Canada (www.riconvention.org/en). 29 June 2018 - "Let's Talk Rotary" informal lunch for all club members at Lotus Pang Suan Kaew Hotel buffet restaurant 11:30 a.m.
30 June 2018 - Chiang Mai Rotary Club Presidents Installation, Empress Hotel, Chiang Mai. 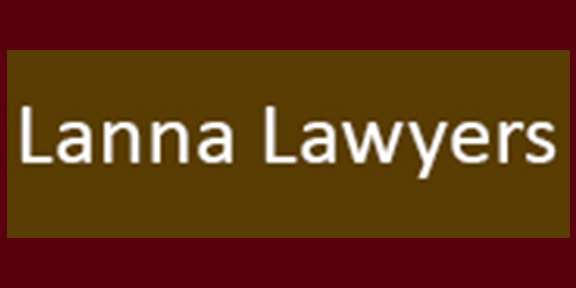 Lanna Lawyers is a Thai law firm with a heart for pro-bono work, especially when it concerns the marginalized people of South East Asia. Their Expat Division can serve the needs of resident expats with native English speaking law partners. Fashion King is reputed to be the best tailor in Chiang Mai. The owners Frank and Vanita are the sponsors of the famous Chiang Mai fundraising event called Bollywood Night. They do much to help the poor and the needy. Hong Kong Lucky is a unique Hong Kong Chinese dining experience. The food is wonderful, and they host our Rotary meetings at their location in the Old City. Our sponsors donate money that supports our operational expenses, freeing funds for the projects we love. Currently we have three sponsors and would like to accept a fourth. 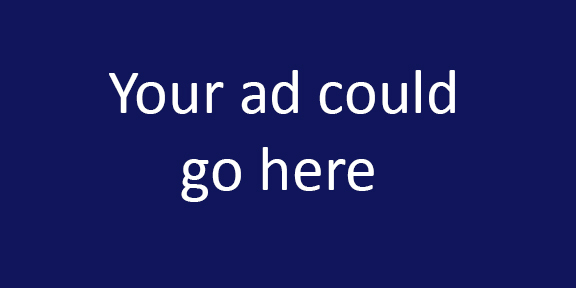 Interested in becoming a sponsor or asking your favorite business to support us? Click on the blue block on the lower right below to learn more.